Riverdale: Who is the Black Hood? Do I think that Mayor McCoy tried to shoot Fred Andrews? No. Could she have someone working for her? Yes. Mayor McCoy has showed us that she wants to keep the peace in Riverdale, although she despises the South side, where gang members and drug dealers reside, (aka sinners). She also is low-key doing business with the Lodge’s, which they are all keeping under wraps… sketchy. The Mayor seems to know a lot about what’s going on in town, more than the average Mayor… The Black Hood seems to be very clued in on what is going on around town as well. While the Mayor is said to have allegedly received threats from the Black Hood, no hard evidence was shown. 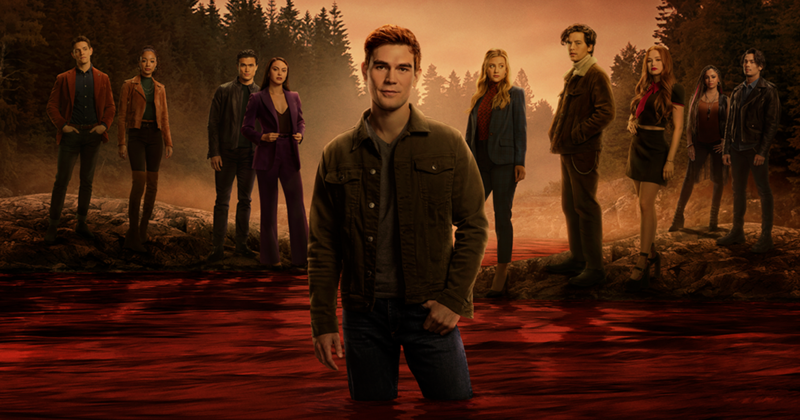 The killer is targeting Riverdale’s sinners. After last weeks episode, we know Mayor McCoy is a sinner due to the fact she’s having an affair with SHERIFF KELLER. This could explain why neither her, nor the Sheriff have been targeted yet. This is Betty’s theory, I see where she is going with it and I don’t think she is crazy for thinking of it. Keller appears to be the only cop in town. I guess he has people that work for him, but where’s the whole team of people like in Law & Order? Or anyone else for that matter? It’s a small town, and Keller has not found Fred Andrew’s shooter, there’s information lacking about Ms. Grundy’s murder, the Sugar Man was killed IN THE JAIL (??????). He doesn’t seem to have any reaction to these gruesome actions, other than the Sugar Man being killed in his jail. He gives off an overall feeling of sketchiness, more so after Veronica saw him sneak off in the middle of the night. Similar to Mayor McCoy, if Keller was the Black Hood, that could be the reason neither of them have been killed for their infidelities. This theory made the most sense right after Betty received the cypher and the first call. How would the Black Hood have known to send Betty a cypher from the Nancy Drew books? If the killer was someone close to her as a child. Alice also stresses heavily how it is important for Betty to keep a “good character” at the start of the school year. One could say a “bad character” involves sinning, perhaps? She sent Polly away to the Sisters because she sinned, could that be to avoid getting rid of her sinning daughter? Unlikely, because Mrs. Cooper went to the same place when she was a teen mom as well, but you never know. Alice is hiding secrets about her past, many that are slowly coming to light. She was a Serpent, prone to violent actions, for example throwing a rock into the window of The Register and maybe even murder? We shall see. Very similar to Alice, Hal is someone close to Betty that would have known about the Nancy Drew cypher. Hal seemed more guilty of killing Jason Blossom than being the Black Hood, but his anger has shown. He has also been shown less and less as the episodes go on… where is he? Listening to town gossip at The Register and additionally plotting murders and black mailing his daughter maybe…. Penny Peabody, a Serpent and also known as the Snake Charmer. I read an article that talked about a new theory from a Reddit thread where Penny is Alice’s half-sister and Betty’s biological mother. My mind is blown, this is a good theory. The theory explains that Penny has people that owe her favors and are doing the work for her. This would also explain why someone who is hardly seen with the Serpents would know the name of Jughead’s girlfriend from the North side…. The Black Hood could be anyone at this point. The killer/black-mailer/hater of sins could be multiple people, it could be someone hired by Hiram Lodge, or maybe it could be Ethel Muggs’ mother attempting to take attention away from Veronica by targeting Betty and waiting for the right moment to make Hiram pay for what he did to Mr. Muggs… UNLIKELY, you never know with those sleeper characters though. Thanks for reading and tune in to The CW tonight for the mid-season finale of Riverdale. Feel free to leave feedback or comment your theories about the Black Hood below!